Beverley is about two miles North of Kingston Upon Hull in the East Riding of Yorkshire. In 1321, the Scots raided as far south as Beverley, causing damage and panic amongst the population there. As a result, the people of Beverley petitioned Parliament for a grant to provide defences for the town. Above. A view of the interior face of the gate. The town at this time, had a system of ditches marking its boundaries, which as well as a token defensive feature, probably acted as the town's drainage\sewage system as well. 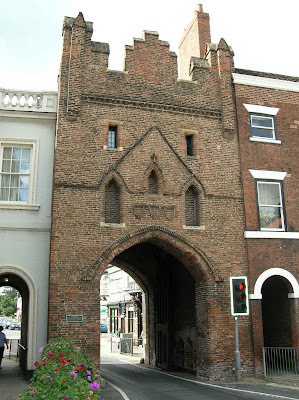 The brick gateway that can still be seen today, The North Bar, is the sole remaining gateway built along with four others all now sadly gone. 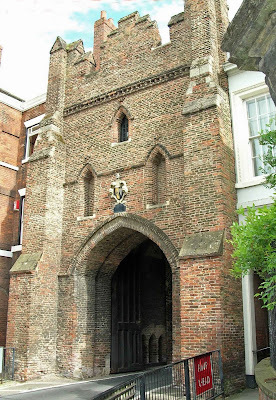 The gateway was rebuilt in 1409, and is essentially the structure that can be seen today. Above. A view of the exterior face of the gate. Beverley also had a number of wooden towers acting as defensive road-blocks into and out of the town, built across minor roads in the area. There was also a chain over Beverley Beck, providing protection against unwanted water born traffic. Impressive pictures there .. and thanks for the infos, I am always curious about learning new things.